A regional, three-dimensional, transient numerical model of groundwater flow was constructed for the Yakima River basin aquifer system to better understand the groundwater-flow system and its relation to surface-water resources. The model described in this report can be used as a tool by water-management agencies and other stakeholders to quantitatively evaluate proposed alternative management strategies that consider the interrelation between groundwater availability and surface-water resources. The model was constructed using the U.S. Geological Survey finite-difference model MODFLOW. The model uses 1,000-foot grid cells that subdivide the model domain by 600 rows and 600 columns. Forty-eight hydrogeologic units in the model are included in 24 model layers. The Yakima River, all major tributaries, and major agricultural drains are included in the model as either drain cells or streamflow-routing cells. Recharge was estimated from previous work using physical process models. Groundwater pumpage specified in the model is derived from monthly pumpage values previously estimated from another component of this study. The pumpage values include estimates for wells with standby/reserve rights that are used in drought years. The model was calibrated to the transient conditions for October 1959 to September 2001. Calibration was completed by using traditional trial-and-error methods and automated parameter-estimation techniques. The model simulates the shape and slope of the water table that generally is consistent with mapped water levels. At well observation points, the average difference between simulated and measured hydraulic heads is -49 feet with a root-mean-square error divided by the total difference in water levels of 4 percent. Simulated river streamflow was compared to measured streamflow at seven sites. Annual differences between measured and simulated streamflow for the sites ranged from 1 to 9 percent. Calibrated model output includes a 42-year estimate of a monthly water budget for the aquifer system. Five applications (scenarios) of the model were completed to obtain a better understanding of the relation between pumpage and surface-water resources and groundwater levels. For the first three scenarios, the calibrated transient model was used to simulate conditions without: (1) pumpage from all hydrogeologic units, (2) pumpage from basalt hydrogeologic units, and (3) exempt-well pumpage. The simulation results indicated potential streamflow capture by the existing pumpage from 1960 through 2001. The quantity of streamflow capture generally was inversely related to the total quantity of pumpage eliminated in the model scenarios. For the fourth scenario, the model simulated 1994 through 2001 under existing conditions with additional pumpage estimated for pending groundwater applications. The differences between the calibrated model streamflow and this scenario indicated additional decreases in streamflow of 91 cubic feet per second in the model domain. Existing conditions representing 1994 through 2001 were projected through 2025 for the fifth scenario and indicated additional streamflow decreases of 38 cubic feet per second and groundwater-level declines. 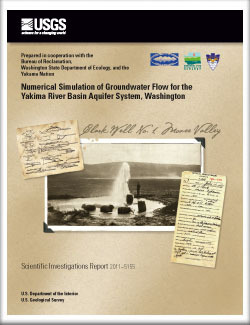 Ely, D.M., Bachmann, M.P., and Vaccaro, J.J., 2011, Numerical simulation of groundwater flow for the Yakima River basin aquifer system, Washington: U.S. Geological Survey Scientific Investigations Report 2011-5155, 90 p.